A fresh look at life from a treasured book of hope.This isn't your grandfather's Purpose Driven Life. 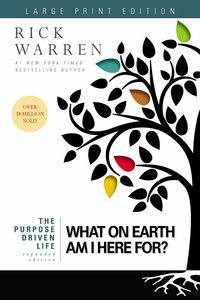 Retooled for a new generation, this 10th anniversary edition includes all the wisdom of the original book, plus two new chapters and fresh insights Rick Warren has gleaned since he first wrote his #1 international bestseller. Discover God's amazing plan for you both now and for eternity as you take a spiritual journey that will transform your answer to life's most important question: What On Earth Am I Here For? Winner of the Gold Medallion Book Award and Christian Book of the Year Award. About "What on Earth Am I Here For? (Large Print) (The Purpose Driven Life Series)"
SPANISH EDITION. In these twelve chapters about leadership, Pastor Rick Warren examines the life and ministry of Nehemiah. This beautiful keepsake gift book enhances the message of THE PURPOSE DRIVEN LIFE with quotes from the book, relevant Scripture verses and full colour photography.